How do we get THC/Cannabinoids through the Micro Fiber Filter? The PerfectPipe® Controls the Temperature. THC/CBD/Terpenes etc. pass through the filter just above their boiling/vaping temp! Cannabinoids (THC/CBD/CBN etc.) and Terpenes vaporize between 125°F & 500°F. Cooling the THC/Cannabinoids below vaping/boiling temperature converts them back to their liquid/oil state. 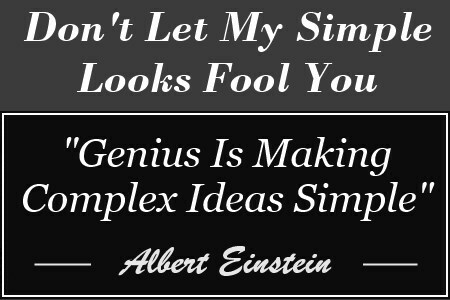 They then fall out of the vapor stream & condense on metal cooling plates (Genius Pipe), on top of water (Bongs/Water Pipes), on the herb & paper (Joint), etc. Micro Fiber Filters Don't Work on Joints! Putting a Micro Fiber Filter on a Rolled Joint does not work! It will block THC at a high rate. The length of herb cools the THC/Cannabinoids too low, leaving them in the filter right from the first hit. 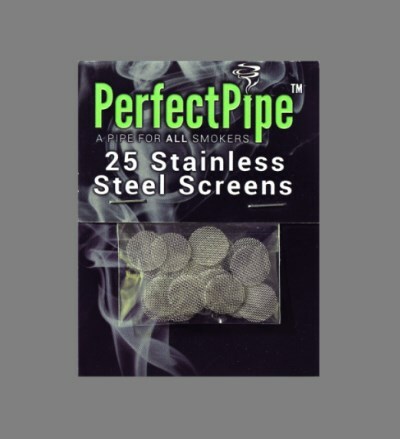 PerfectPipe® Information A Must Read For All PerfectPipe® Users! 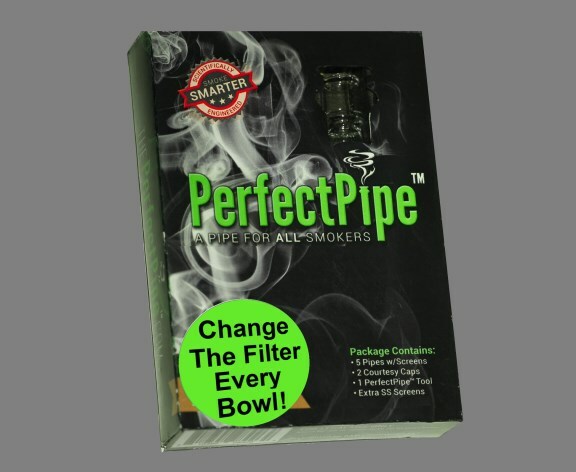 The PerfectPipe® Patented Bowl Design Utilizes Physics to Extract High Levels of Cannabinoids and Terpenes. How? By Burning the Herb at low temperature with Fire Removed! Why do I need to Remove the Flame? 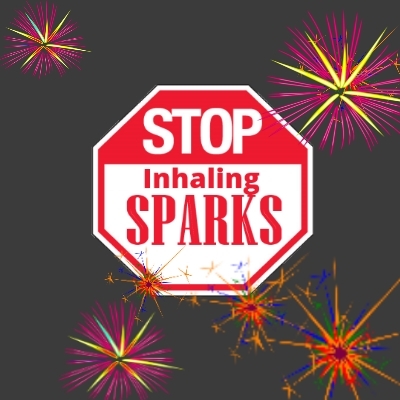 * Because Fire Kills Cannabinoids and Terpenes on Contact! * Fire abuse is the biggest killer of THC. * Light gently, short puff's like a cigar, and remove flame before taking hit. * High Rate Extraction is acheived by taking a controlled draw with the fire removed. 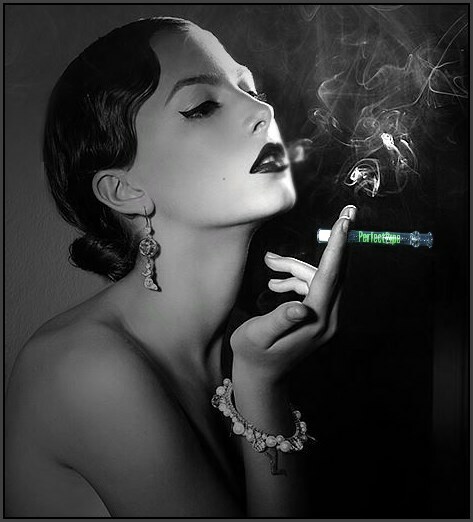 * Herb may go out between hits, which limits waste, just flick off some ashes and re-light. * A hard draw produces extreme heat which destroys Cannabinoids. 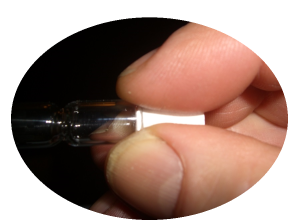 * A Slow Draw extracts Cannabinoids at high rate with gentle heat release. * Experiment yourself to find the perfect draw speed for optimal extraction. Bowl Too Small You Say? 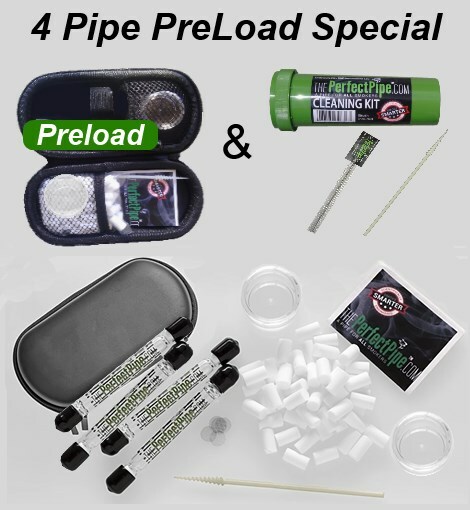 * With a Fire Free Slow Draw you will get 4 to 6 full powerpacked hits from one bowl! 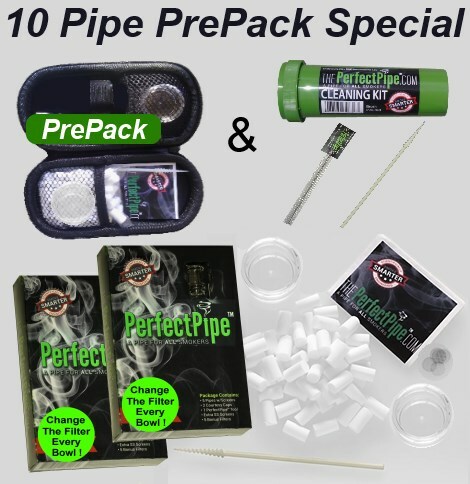 * The PerfectPipe® High Rate Extraction reduces herb usage as much as 80%. 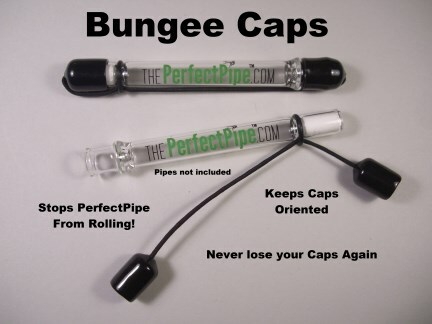 * Many PerfectPipe® users report needing only one small hit. * Bowl holds approx. 1/2 of a joint (.4g) of packed herb. * Use ground up herb. Pack it Tight &dash; Burn it Slow! Why a Stainless Steel Screen? * The stainless steel screen is the first stage of micron filtration. 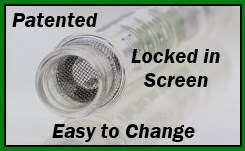 * A screen is necessary for firm packing & high rate extraction. * Stainless Steel has a very high melting temperature. Never use brass. Why a Micro Fiber Filter? * The Micro Fiber Filter is the second stage of micron filtration. 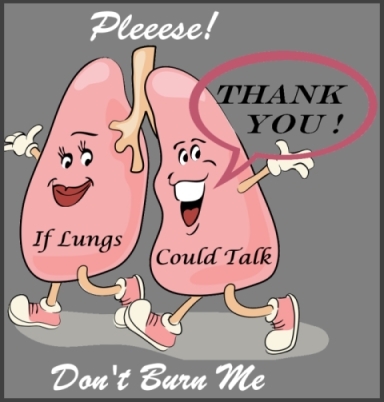 * The filter protects you from burning particulates and significantly reduces heat & ash. 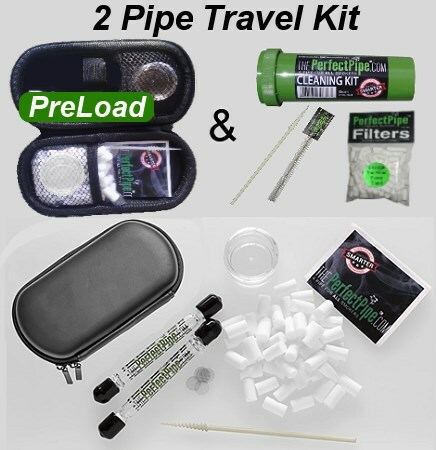 * A new filter is used with each bowl of use for High THC/CBD delivery. With a Fire Free Slow Draw on the PerfectPipe®, Cannabinoids/Terpenes/Flavonoids stay above their vaping/boiling temp as they pass through the filter to you. Gentle - Light Gently & Remove Flame! You should get 4 to 6 full hits from one bowl. If not, you are drawing way too hard. You will be amazed how much higher extraction you get when you find the perfect Controlled Draw Velocity! The Filter is easy to replace with our patent pending PerfectPipe® Tool. 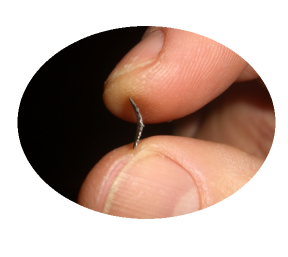 If you lose your tool, don't worry, just use metal tweezers or a drywall screw. 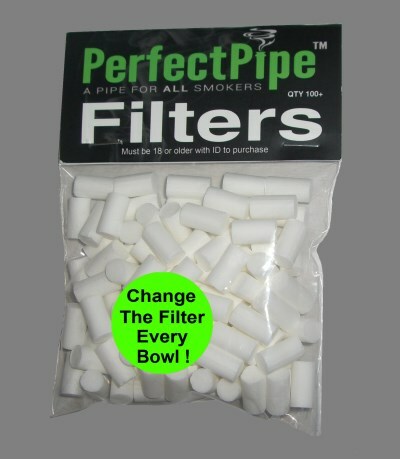 PerfectPipe® Filters sourced from Italy are the highest quality filters available. 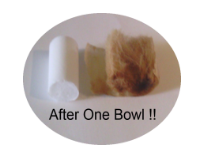 A new filter is used with each bowl of use! High Quality Stainless Steel Screen stays in place with patented tech. The screen is very easy to remove and replace. No smell or mess w/ Caps On! 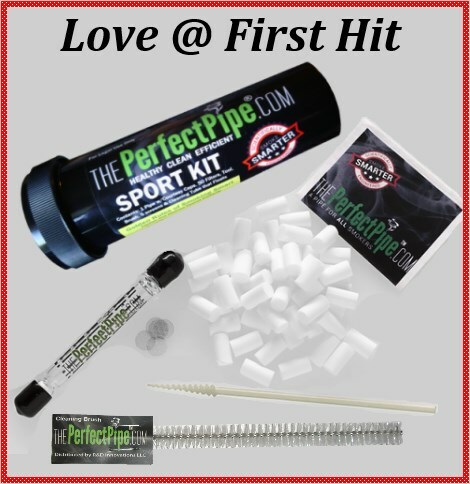 Cleans the PerfectPipe® just like new. 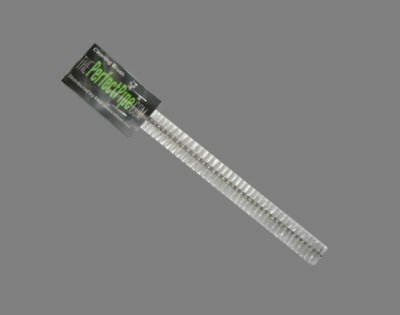 The PerfectPipe® Cleaning Brush is made from high grade nylon and stainless steel wire for durability. 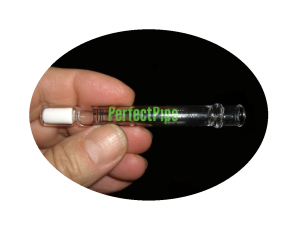 The PerfectPipe® was developed utilizing over 40 years of Scientific Glassblowing experience. 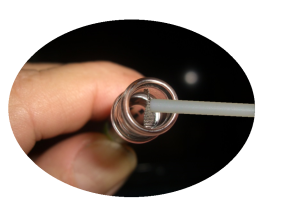 The PerfectPipe® is made out of laboratory grade borosilicate glass on automation machines for the utmost quality. 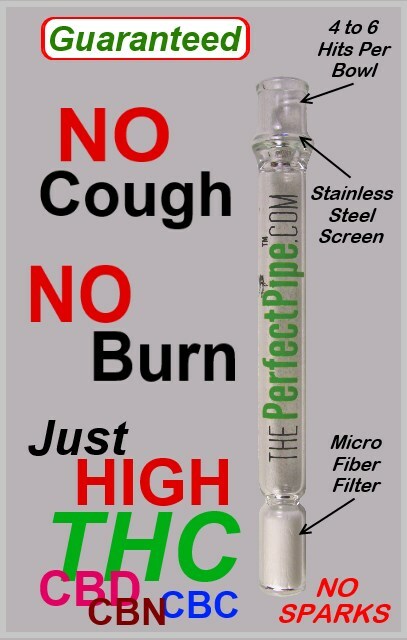 The PerfectPipe® is designed tough, yet all glass can break. 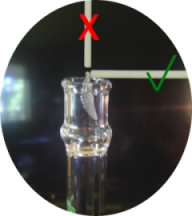 Avoid tapping the PerfectPipe against glass ashtrays and hard surfaces which may crack the glass. With the Courtesy Caps installed the PerfectPipe® is nearly unbreakable. We think you will agree that glass is the best smoking medium and any occasional breakage is acceptable. We make replacements available at a very low cost. Enjoy and good health to all! Bend screen just a little. Screen must fit snug in bowl! Leave a little bit of screen sticking out top of bowl. Very Important! Place tool sideways against backside of bend. Keep tool against this same point on the screen while pushing screen all the way down. Screen will rotate & pop in place.